There are at least a dozen different file types you can import into Silhouette Studio - but not all files types are supported in all versions of Silhouette Studio. If you've ever gotten the error "Silhouette Studio File Not Supported" it's because you are attempting to import a file that the version of Silhouette Studio you are using can't open. This Silhouette Studio tutorial provides an easy break down and list of file types Silhouette Studio supports...and therefore which can be cut with your Silhouette CAMEO, Portrait, and Curio. 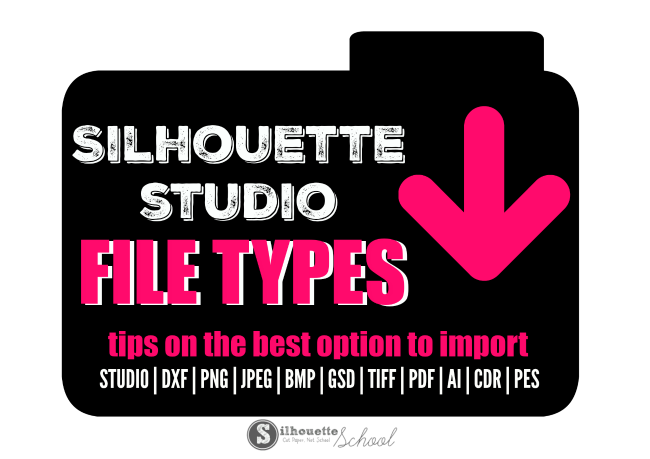 It's helpful to know what types of files can be used in Silhouette Studio for cases when you purchase a file or graphic bundle or have the option to download various file types from an outside source like The Hungry JPEG. Why import a file type that needs to be traced if you can actually open another file type that is easily opened in Studio with cut lines?! For example, DXF files will open in standard Silhouette Studio with cut lines and all you have to do is turn them on. Other files types, like JPEGs, need to be traced to generate the cut lines. Here's a break down of which file types are compatible with each version of the software so you can determine the best file type for import. The files types have been listed in order of what I would consider to the most user friendly in Studio. Only .Studio files and DXF files will open in Silhouette Studio with cut lines. However, the .Studio file type is proprietary so third parties can not sell that file type. That makes DXF one of the absolute best options for Silhouette Studio users when .studio files are not an option. Just like .Studio files, DXF files will open in Studio with cut lines! The other file types that are supported by basic Silhouette Studio will open, but will need to be traced to produce cut lines. For example, let's say you want to convert a pdf to a Silhouette Studio file. You would have to drag and drop the PDF file from your computer's desktop into the work space in Studio. Use the trace tool to trace the PDF to produce cut lines. Now you can cut the file. When it's time to save this file: File > Save > Save to Library/Hard Drive. When you save from Silhouette Studio the file is automatically saved as a .Studio file. SVG and GSD files will open in Silhouette Studio with cut lines around them. The files types have been listed in order of what I would consider to the most user friendly in the Silhouette Studio Designer Edition software. The ability to import SVG files - a standard in the graphic design world - alone makes the one time upgrade to Silhouette Studio Designer Edition worth it. The fact that Silhouette Studio Business Edition users can import AI files, as well as CDR, is great news for designers who prefer to design in Adobe Illustrator or Corel Draw. Finally, I know you're going to ask "Can Silhouette Studio export or save as (fill in the blank)?" The answer is 'no' the large majority of the time. Silhouette Studio will only allow users to directly export files as .Studio files or PDF. If you're looking to convert a Silhouette Studio file to JPEG or PNG (or other file type) you can either export as a PDF and convert the file from there or use the Snipping (PC) or Grab (MAC) tool. Using one of these tools usually results in a .tiff file which you will then have to convert into your preferred file type. It's no longer possible to save or export from Silhouette Studio as an SVG. First off Melissa love this site. Next I have DE and still occasionally have issues opening SVG, JPEG, and other files that I should be able to open. Any idea why? So, what do you do when they are Silhoutte Store files and they do not work when trying to open in the most current version of Silhoutte and you are working through your laptop? I have a couple that I have never been able to open after purchasing and all Silhoutte can say is we can refund your money. Honestly, when I purchase files I do not open each one until I am ready to use it. Since then I have made it a point to open each file that I have bought right then and there. I purchased the Cameo3 with basic studio, this November. I then upgraded to Business Edition Studio. I still get the not supported error when attempting to open a CDR file. I know I am in the business edition, as it says that at the top. HELP! I purchased the premier font from the silhouette store, however I downloaded it but keep getting the message "The type of file you are attempting to access is not supported" Now what can I do to be able to use it?